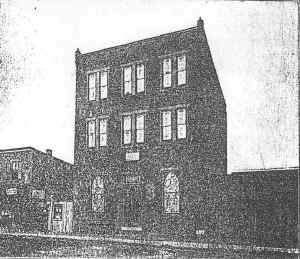 Founded in 1913, Temple Baptist Church was initially located on Fulton Street. The first pastor of the church, Rev. R. Butcher carried out his duties with Deacon Joshua Bland Sr. serving as chairman of the Board of Deacons and R. J. Bouden in the capacity of church clerk. After one year, the congregation reorganized in December of 1914 and relocated to Sixth and Parker Streets. Several years after moving to this new location, approximately 1917-1918, Rev. E. B. Gordon was selected to serve as pastor. He served for fourteen and one half years. Under Rev. Gordon’s administration, the building was purchased and renovated. In 1932 Rev. Gordon resigned and Rev. J. A. Jordan was elected as the new pastor who served in that capacity for four years. In 1939, due to a lack of membership growth, Salem Baptist Church, along with its pastor Rev. Dorsey W. White, merged with Temple Baptist Church, forming a bond of love and strength. The following accomplishments were made under the leadership of Rev. White. 1. The membership of the church increased and new organizations were formed. 2. The mortgage on the building at Sixth and Parker Streets was burned. 3. An electric organ was purchased to enrich the services. 4. The sanctuary was carpeted. 5. In January 1954, plans were made to remodel the pulpit and choir lofts. 6. Communion table and pulpit furniture were purchased. 7. In 1955, the church became incorporated with the submission of a constitution and by-laws to the state government of Pennsylvania. 8. Additional renovations were made to the church in 1960. 9. Deaconess Alma Hudson and Brother Elbert Roane organized a Vacation Bible School with an enrollment of approximately one hundred students. 10. Temple Baptist Church held its first Women’s Day Luncheon. 11. A Youth Department was organized under Sister Essie M. Jones who served as the first advisor for the group. 12. The BTU was revitalized under the leadership and guidance of Rev. Robert Ellington. Rev. White served as pastor for almost thirty years. Due to failing health, he resigned and Rev. Jeremiah W. Witherspoon was chosen in July 1967 to serve as the new pastor. His services began on the first Sunday in September 1967. Under Rev. Witherspoon’s administration the Male Chorus, Maryland-Virginia Club, Carolina Club, Memorial Guild, Starlights and Missionary Society #2 were organized. In 1978, the church, under the leadership of Trustee Morris P. Briscoe, Chairman of the Board of Trustees, entered into negotiations with the St. George Greek Orthodox Church to purchase the edifice at 736 West Seventh Street. The church paid cash for the building and borrowed money from Southeast Bank (now named First Union) to make the necessary renovations needed to accommodate our needs. In July 1978, the congregation of the Temple Baptist Church moved to its current location. As the congregation of the Temple Baptist Church expanded and the activities of the church grew, it was through the vision of the pastor and joint board that additional space was needed. In 1995, this vision was presented to the congregation at a quarterly church meeting that we look into the possibility of erecting a building that would join the sanctuary with the “carriage house”. The firm of Jack Swerman, A.I.A. was hired as the architect to draw plans for this project. In September 1995, a contract was signed with D. Pileggi and Sons, Inc. to begin the work. Finally, in February 1997 the annex was completed and ready for use. The congregation was blessed in the year 2001 to purchase two new pianos and a new van. In October 2002, the church celebrated the 35th pastoral anniversary of Reverends Jeremiah and Ruby Witherspoon. The event was a huge success and a blessing to our pastor and first lady. 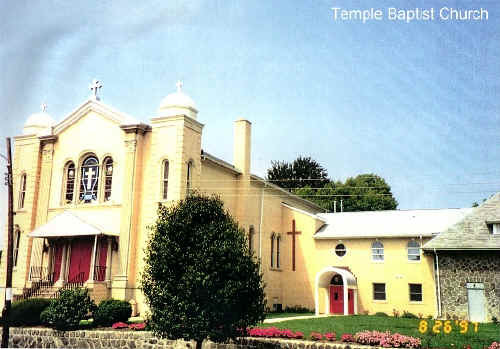 The following brief History of Temple Baptist Church is taken from the Home Directory of the Colored People of Chester, 1906 compiled by Lawrence L. Barrett & C. I. Wilson. This reference is available at the DCHS research library. This church was for quite a while known as the Mt. Zion Baptist Church. But since 1901 it has been known as the Temple Baptist Church; the congregation having purchased Naomi Temple on Fulton street as a place of worship. In 1901, Rev. John W. Thompson, having resigned the pastorate of the Calvary Baptist Church of this city, to continue his studies at Lincoln Univeristy, was petitioned by this congregation to administer to their spiritual needs during his stay at Lincoln. This he finally consented to do. This congregation has since then become one of the largest colored churches in the city, paying a good salary and is a spiritual force in the city. It is an institutional church, and is now being fitted up for all kinds of trades for both male and females. A great deal of attention will be paid to domestic science. When the weather permits it, a kindergarten is conducted. Lessons in instrumental music are given the year round.